A Tokyo surgeon and explorer plans to embark on a five-year journey Thursday to trace the origins of the Japanese people. Yoshiharu Sekino, 55, of the western Tokyo suburb of Kokubunji, begins his new adventure roughly two years after completing a 50,000-km trek to trace the “great journey” that humans are believed to have taken as they migrated from Africa to other parts of the world millions of years ago. He plans to trace what he calls the three possible paths that the ancestors of the Japanese are believed to have taken about 30,000 to 40,000 years ago to reach Japan. The “northern” route is believed to have brought people to Japan from Siberia via Russia’s Sakhalin Island, the “continental” route from China via the Korean Peninsula, and the “kuroshio” route from Southeast Asia along the Japan Current. Sekino also plans to explore an additional sea route, which people are believed to have taken to reach Pacific islands. During his previous journey, Sekino traveled to 35 countries between 1993 and 2002 to trace the “great journey” in reverse, from the southern tip of the American continent to Tanzania. Like his previous trip, Sekino plans to travel only on foot or by bicycle without relying on vehicles. He plans to trace the four routes on an intermittent basis through fall 2009 and to study the traditional cultures in different locations that might be linked to Japanese culture. “This time, I want to focus on the paths that the Japanese are believed to have taken,” he said. Sekino, who has taught at Musashino Art University for the last two years, travels abroad about three to five months a year. He plans to start his journey from the “northern” route, which will take him to Mongolia and Russia in the summer and to the estuary of Amur River in winter. 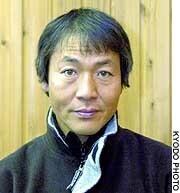 He also plans to walk the frozen Mamiya Strait on foot to reach Sakhalin. Sekino’s exploring spirit dates back to his time at Hitotsubashi University in Tokyo, where he set up an exploration club and covered the entire length of the Amazon to explore the life of indigenous peoples. During his travels to the Amazon, Sekino became acutely aware of the shortage of medical services for indigenous peoples. After graduating from Hitotsubashi, he entered Yokohama City University and became a surgeon. In 1999, he received the Naomi Uemura Award, named after the famous explorer who was the first in the world to conquer the highest peaks on five continents and disappeared on Mount McKinley in Alaska in February 1984.